Wetland habitats are transitional regions between land and sea that provide an array of ecosystem functions. Wetlands filter pollutants from surface waters, store water from storms; prevent flood damage; recharge groundwater; serve as nurseries for saltwater and freshwater fish and shellfish that have commercial, recreational and ecological value; and provide habitat for a variety of fish, wildlife and plants. The St. Johns River Water Management District and its many partners have worked to reverse the damage done to coastal wetlands to preserve the natural and economic benefits that wetlands serve. Through this work, more than 23,000 acres of coastal wetlands have been restored through the end of 2014. 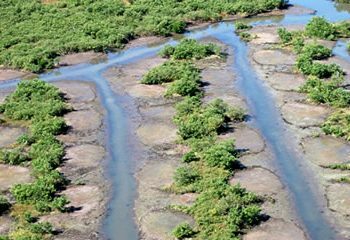 Following are several types of coastal wetlands restoration projects that have been successfully implemented. 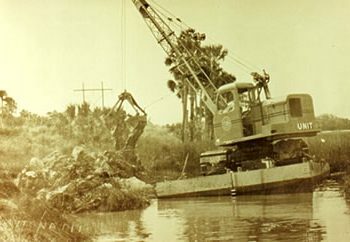 In the 1950s and 1960s, large excavators called draglines were used to create an extensive network of deep, wide ditches and spoil piles cut through historical coastal wetland habitat, altering the hydrology of the remaining wetland and providing access for mosquito-eating fish. The ditches were cut to interrupt the life cycle of saltmarsh mosquitoes, which lay their eggs on moist soils so that the eggs hatch when the marsh is flooded by tides or rain. While dragline ditching effectively reduced the mosquito population in coastal wetland areas, an unintended result was a greatly altered and reduced wetland ecosystem. The most extensive ditching occurred in Mosquito Lagoon, with ditching also present throughout the Indian River Lagoon and the Northern Coastal Basin. In the most extensively ditched areas, up to 80 percent of historical wetlands were replaced with ditches and spoil pile. This reduced ecological productivity, resulting in reduced fish and wildlife, and the protection from storms that wetlands provide. Colonization on the higher spoil elevations by upland and invasive plants, such as the Brazilian pepper. Diminished numbers of mangroves, which were replaced by terrestrial and exotic species on the elevated portion of the pile. Loss of plants and grasses that serve as juvenile fish habitat and provide food and shelter for fishes, crabs and shrimps. 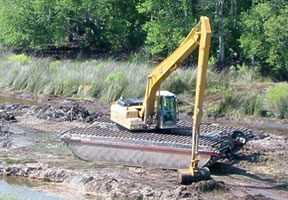 Dragline ditch restoration projects require the use of an amphibious excavator mounted on pontoons. Vegetation is cleared from the spoil area and placed in the adjacent ditch. The area of the spoil pile and the newly filled ditch are carefully graded to the elevation of remaining adjacent wetland. Restored wetlands provide more space for wading and shore birds and greater production of fishes, crabs and shrimps and the plants they depend on. A historic excavation photo from Volusia County Mosquito Control. Dragline ditching as seen from the air. In this photo from Volusia County Mosquito Control, a dragline ditch is filled. Ditches are less visible in this coastal wetland restored in 2010. Mosquito impoundments were designed to manage mosquito production by isolating wetlands from the nearby waterway, such as the Indian River Lagoon, and flooding the impoundment using wells or pumps. The impoundments were constructed with heavy machinery that dug a “borrow ditch.” Sediment from the ditch was piled on the outer edge of the marsh to create a dike, which isolated the interior wetland from the rest of the estuary. 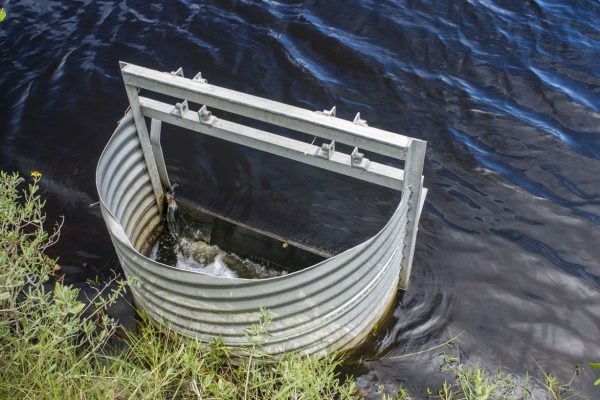 Decades of research has shown mosquito production can be halted by reconnecting impoundments to the lagoon via culverts and flooding the impoundments only during the summer mosquito-breeding season (September through May). Open culverts allow vast numbers of fishes, shrimps and crabs to regain access to their historical wetland nursery and feeding grounds. Wetland vegetation also benefits. This seasonal mosquito control method is known as rotational impoundment management, or RIM. Nearly half of impounded wetlands acreage is within the Kennedy Space Center/Merritt Island National Wildlife Refuge/Canaveral National Seashore complex. Though initially constructed for mosquito control, many of these impoundments have been managed to benefit migratory birds (primarily ducks). Where mosquito control and wildlife management are not a priority, impoundments have been considered for full restoration. The process involves burying vegetation from the dike surface in the adjacent ditch and grading the restored area to the existing wetland elevation. From the 1880s through the 1950s, significant navigation channel dredging activities were undertaken to create and maintain what is now northeast Florida’s section of the current Intracoastal Waterway. In many areas, the channel was cut through pristine wetlands, depositing large amounts of spoil beside the new channel and filling important estuarine nursery habitat in the district’s Northern Coastal Basin.